According to data available for Europe, the annual growing season has been lengthening, more intensively in northern and eastern Europe than in western and southern Europe and in the Mediterranean region (also in Slovenia). The lengthening of the growing season is expected to continue throughout Europe. Lengthening of the annual growing season will allow northward expansion of warm-season crops to areas that were not previously suitable while in the southern Europe the warmer conditions will allow the growing season to extend into winter. This is not to be expected in much of central and southeastern Europe, in Slovenia as well, where heat and summer’s drought will hinder the crop production. The length of the annual growing season is the period between the day when the average daily air temperature in spring exceeds 5°C and the day when it drops below this value in autumn. An air temperature of 5°C is generally recognised to be the lowest temperature threshold for plant vegetation. The 5°C temperature threshold is also used as one of the conditions for the classification of agro-ecological zones. In the context of climate change, it enables assessing the impact of changing climate on the development of plants and their environment. This indicator also serves as a tool in preparing for adaptation to new conditions, thus minimising the potential negative impacts of climate change. • To estimate the effect of climate change on plant development. • To prepare adaptation procedures for the newly arising climatic conditions and mitigation of possible adverse effects. The rise in average air temperatures and the increased frequency of days with temperatures exceeding the vegetation threshold influence the prolongation of the length of the annual cycle of vegetation in Slovenia. The latter has a non-homogeneous character, with appreciable deviations within the period in question (i.e. 1961-2009). The 5-year running average indicates a slight cyclical oscillation. The last cycle of 5-year running average values indicates an increase in the length of the annual cycle of vegetation since the 1990’s, which is also made strikingly evident by the comparison of average values for the periods of 1961-1990 and 1991-2016. Based on various international studies, a prolongation of the annual cycle of vegetation in Europe has been observed. 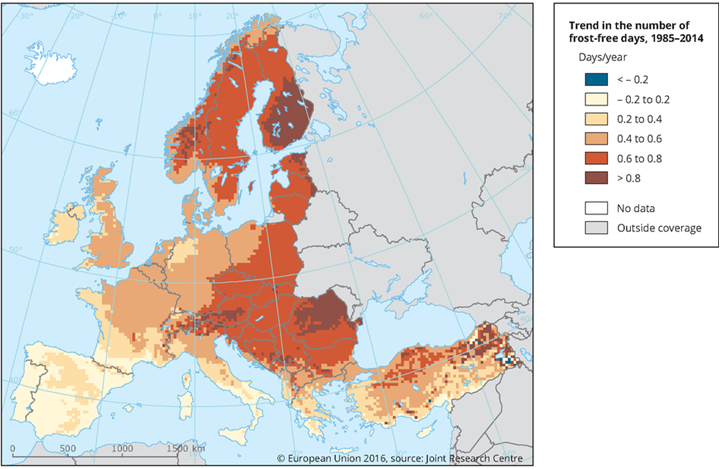 The analysis of the number of days with a positive minimum air temperature (frost-free days) for the period 1985–2014 showed increasing trends with uneven distribution across Europe. The greatest change (0.8 days per year) was observed in northern and eastern Europe, while it was less pronounced (0.6–0-8 days per year) in the major part of central Europe (including Slovenia) and was smallest in the Mediterranean region. A lengthening of the growing season will have an effect on the expansion of more warmth-demanding plants towards northern parts of Europe. In southern Europe, changed conditions will enable the extension of the growing season into the winter months, while in the major part of central and south-eastern Europe, this will not be possible, but rather crops will be more exposed to dry and hot summers. Similar conditions can be expected in Slovenia, where phenological development is happening earlier due to an earlier start to the growing season, which greatly increases risks of freezing as surges of cold air from the north have become more common. Since 2010, three severe frosts reaching the proportions of a natural disaster have been recorded. The frequency of summer droughts has also been increasing – in the same period, Slovenian agriculture was hit by three severe summer droughts with consequences equalling a great natural disaster (2013, 2015, 2017). In Slovenia, changes in the length of the cycle of vegetation are expressed as gradual changes in agricultural technology, which, owing to the nature of agricultural production, is a lengthy process. In introducing new technologies into agricultural practice, special account is to be taken of environmental factors, obligations to follow environmental protection legislation and supporting information systems (agro-meteorological data). In accordance with the National Environmental Action Programme, reduction of the burden caused by the changing length of the cycle of vegetation (introduction of new varieties) will require upgrading of existing legal and economic instruments for environmental protection (biodiversity, sustainable development), acting in line with the adopted international conventions (Framework Convention of the United Nations on Climate Change, United Nations Convention to Combat Desertification, Convention on Biological Diversity), strengthening supervision over sources of environmental hazards, raising environmental awareness, enhancing knowledge on environmental issues, and encouraging sustainable agricultural practices.